Christian Petersen/Getty ImagesColin Kaepernick might have met less resistance if he were in the NBA. NFL training camps and preseason games are now underway and Colin Kaepernick is still without a job, despite two seemingly golden opportunities that arose recently with the Baltimore Ravens and Miami Dolphins. 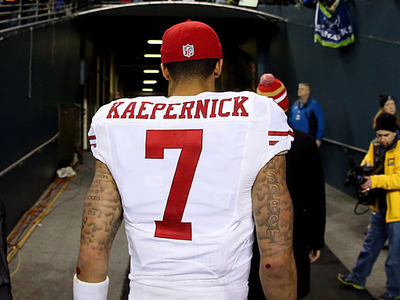 While the debate over why Kaepernick remains on the outside looking in rages on, there are some in the NBA world who seem to believe that Kaepernick, or a player staging a Kaepernick-like protest, would be treated much differently in the basketball world. Rick Maese of the Washington Post wrote a column titled, “If Colin Kaepernick played basketball, the NBA would embrace him.” Among the people Maese spoke with for the story was Dallas Mavericks owner Mark Cuban who noted that the NBA holds its players to a different standard than the NFL. Cuban’s quote was met with criticism as some noted the NBA once famously suspended Mahmoud Abdul-Rauf in 1996 for refusing to participate in the national anthem, a move he believes led to being blackballed from the league. “On March 12, 1996, the NBA suspended Abdul-Rauf for one game, citing a rule that players must line up in a ‘dignified posture’ for the anthem. It cost him almost $US32,000 of his $US2.6 million salary. The players union supported Abdul-Rauf, and he quickly reached a compromise with the league that allowed him to stand and pray with his head down during the anthem. But at the end of the season, the Nuggets traded Abdul-Rauf, who averaged a team-high 19.2 points and 6.8 assists, to the Sacramento Kings. In Cuban’s defence, this was more than 20 years ago and the NBA is a much different league today, especially under commissioner Adam Silver, as noted by ESPN analyst and former NBA head coach Jeff Van Gundy.